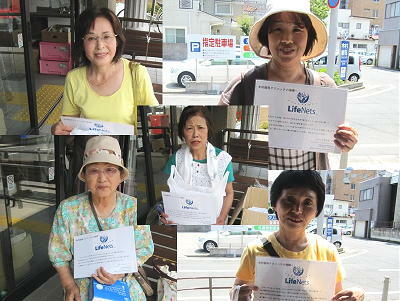 LifeNets wishes to help in its own small way with the the humanitarian crisis in Japan. Our policy is to help victims directly. We thank you for all the contributions that we have received so far. They will go to specific families and we will be certain that they have received assistance. One of our contacts who will help us get the aid to victims is Dr. Yumi Yamamoto who has been a dear friend and supporter of LifeNets for several years. She has visited and stayed with us in the United States. She is an ophthalmologist. We will be posting reports from her on this page regularly. On April 10 our LifeNets representative Dr. Yumi Yamamoto received a request from a nurse, Mrs. Sato, in the affected Fukushima area. There is a seven year old boy Tatsu who has a small inborn eye ball and has been wearing an artificial eye. 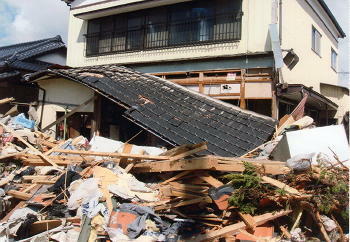 His house was completely destroyed by the earthquake. In Japan April is a new school term, and just a few days ago he had a celebration ceremony of entering elementary school. Because he is getting bigger, his artificial eye got smaller and parents wanted to buy a new one for him. If he suffers from a defect of the complete eye ball, the government will pay for it, but because his problem is a "small eye ball," there is no way to get any help. The cost is about 90,000 yen ( about 1125 USD). This week it has been almost a year since March 11th, 2011. I appreciate your kind consideration for Japan through the year. On February 1st, there was a symposium in Kochi City where I live. The subject of the symposium was 'What we can do in the disaster for visually handicapped people'. 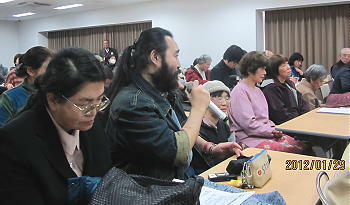 Four people from Iwaki in Fukushima were invited as the panelists. 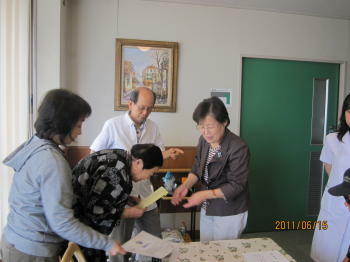 They were Dr. Kimura, Mrs. Sato (a nurse at Kimura Clinic), Mr. Sakano (a patient of the clinic), and Mrs. Sakano (his mother). Dr. Kimura and Mrs. Sato told us how they helped people in the confusion after the big earthquake. At Dr. Kimura's clinic, there were unoccupied beds, and they decided to bring visually handicapped people from the shelters. They tried to get the information of the people, but in the chaos, nobody gave them any information. Some officials even said they needed to protect privacy of the citizen. What they did was that they visited shelters by themselves and found mothers with babies, who were the most easily recognized even in the crowded shelters. Mr. Sakano answers to questions from the audience (the place was full of audience including TV and newspaper reporters). His mother sits next to him. They said after the news of explosions at the nuclear plants, everyone tried to leave the city. They could hardly see any people in post offices, electric companies, super markets, telephone companies, hospitals, city offices, etc. The city was deadly quiet and empty. Mr. Sakano, 39 years old, was diagnosed as diabetes when he was around 35 years old. Unfortunately the disease affected his eyes. In spite of several ocular surgeries, he became blind. After that he was living reclusively in his house. He was desperate at his future and life and he had very bad feelings with doctors who (he believed) made him blind. On March 11th, 2011, he felt unusual big shakes. His house was far from the ocean, and the tsunami did not come there. But after the earthquake, every life line stopped, including water, electricity, telephone, and gas. He and his mother had to go to the shelters with other people. There he found how difficult it was for him to live in the unfamiliar circumstance. He never knew how to use the bathroom except his own house. The important messages such as the time of next foods provides were put on the walls as posters. Because he was with his mother, he could know about them. He noticed he could not live there without help and communication with others. He had to tell people around him that he was blind, and he needed help. Then, he found out, people would help him, and become friends with him. He and his mother spent more than a few months at different shelters before they moved to an apartment which the city provided. He is not living like before any more. He has friends and enjoys going out for picnic, cooking school or any other activities with Dr. Kimura, Mrs. Sato and other volunteer people in Yukari (read about my previous reports). He knows how important it is to communicate with people. He concluded his speech that greetings are the most important at any circumstance. 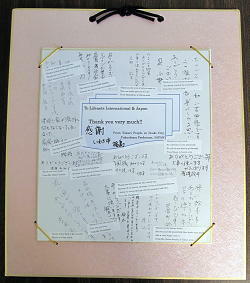 It was a wonderful surprise a few days ago when we received a "thank you" card from Japan beautifully and thoughtfully created by the people we had helped. The card is shown on the right To see a closer up of the card click here to read some of the beautiful things that are said. 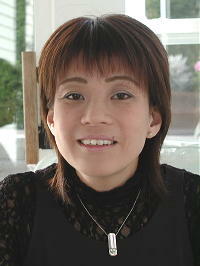 Hi, it was a secret between Ms. Sato and me. We thought you and Bev would be very surprised and pleased to see the message board!! It was my idea, but Ms Sato (and Yukari volunteers) cooperated and worked out so that people would write personal messages to send directly to you like your help was arrived directly to them. I think they are so sweet, and they really wanted to show their gratitude to those who donated. I still have some money left, and yesterday I sent mineral water bottles there, because water from the faucet smells awful due to too much sterilization and even if it is 'biologically clean', there are no patients who want to let their children drink it. It is natural that people buy water to be used by their body. I also got a letter from a seventy-year old lady today. A few weeks ago a woman who wanted a sewing machine wrote me. I wrote her back to write us in more details. 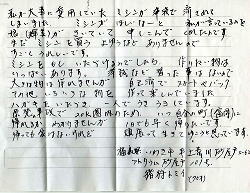 In today's letter she wrote that she lost her house in the tsunami, and because the area is within 20 kilometers from Fukushima nuclear plant, she does not know when she could go back to her hometown. Her precious sewing machine was gone by the tsunami too. She has not learned how to sew, but she used to enjoy sewing small things such as bags, clothes. She writes she felt 'excited' when she knew that LifeNets might give her a new sewing machine. A cheap and handy but fine enough sewing machine could be bought and sent to her by about 100 USD. I think I ll send her some materials and colorful threads by my own donation, too. Oh, maybe she needs scissors, too!! I hope this old nice lady can be happy with LifeNets sewing machine! Now, she lives in an apartment house which was provided by the city. Victor, through this series of disaster, what I have been moved most is how Japanese people behave orderly and unselfishly. At Yukari we received a lot of aid not only from LifeNets but other organizations, and we can easily imagine everyone wants to get as many as they can at such a circumstance. But Yukari volunteers made a rule. They put 'points' to each goods, such as 100 points to slippers, 200 points to laundry detergents, etc. and they decided each person could get 600 points at one time. So, people do not fight, and think what they really need. You may notice in the pictures that each women have plastic bags with similar size full of goods they chose thoughtfully. They look satisfied and thankful with what they had chosen and received. Victor, please edit this and post it. Of course you can post pictures attached in this message. Women knew and understand they will be famous and international through LifeNets!! "The tsunami dragged away everything including my favorite sewing machine. My daughter heard I said I wanted to have a sewing machine, and wrote a message to LifeNets, Japan. Because I cannot afford to buying sewing machine, I would be very happy if I get a sewing machine, I have a lot of things that I want to make. Though I have not learned how to sew, I used to enjoy sewing small things such as bags and clothes, in my own way. Because I received a card from you, I felt happy and excited. 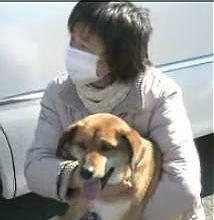 My hometown is within 20 kilometers from Fukushima nuclear plant, and I don't know when I can go back there. I want to go back as soon as possible, even though I don't have any house to live in any more. I think I will keep living with courage." 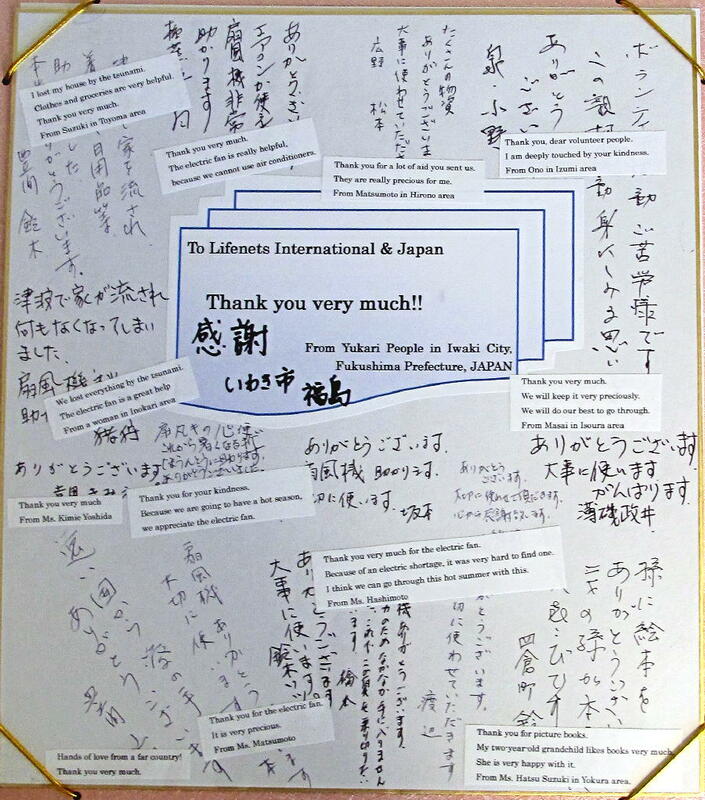 I had received a lot of heartfelt messages of gratitude to LifeNets from people in Iwaki City, Fukushima Prefecture. By now many people at the disaster area have left the shelters and moved to temporary houses which the government prepared. There are people who lost their families, houses, furniture, cars, or just cannot go back to their houses because of the nuclear contamination. All of them have to recover their lives, but many are lacking in every daily things to start their lives from a scratch. Besides electric fans, LifeNets had sent following items to the area; retort pouch curry, new T shirts for adults, Miso soup powder, corn soup power, cling wraps, table duster, kitchen sponge, laundry detergent, hand soap, Magiclean (kitchen), Magiclean (toilet), hair shampoo, Japanese green tea, insecticide spray, etc. Because many people there do not have enough clothes, my friends in Kochi Prefecture, which is far away from the area, donated summer clothes and Lifenets paid the charge of the transportation. Japanese soccer team won 2011 FIFA World Cup yesterday Their message represents every individual heart of Japanese to friends all over the world. Thank you. 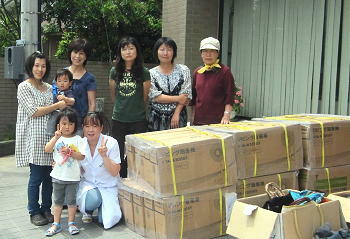 The volunteer group 'Yukari' at the area helped to distribute these things to those who were in need. Now people have to be independent of the support by the government, and they are struggling for going through this hot summer. I believe your support is great help for them. Thank you very much. Some of the aid money has been used to send much needed electric fans to the citizens in Iwaki City about 30 miles from the Fukushima nuclear reactor. Yumi Yamomoto writes about our last LifeNets initiative. You know it is the rainy season and it is very hot and humid. The electric fans were really helpful there. In Fukushima, they are afraid of opening windows due to a risk of nuclear contamination, but many people cannot afford to turning the air conditioner on, because they are really poor now. Of course there are people who do not have air conditioners at the shelters, temporary houses, or new apartments. There are many old people who are carried to hospital because of heart attack caused by mental stresses or dehydration. Young mothers are so afraid the influence of nuclear to their children. They don't know what to eat or what to drink. And even yesterday there was news about shakes at several places in Japan, including Tohooku area. It has passed 4 months now, Victor. Here are messages from Mr. Abe and Mrs. Hashimoto, who are visually handicapped, and lost everything by the disaster on March 11th. Below their thanks messages you will find more about what happened. "I really appreciated for your beautiful message and strong support for what I had to suffer after March 11th. 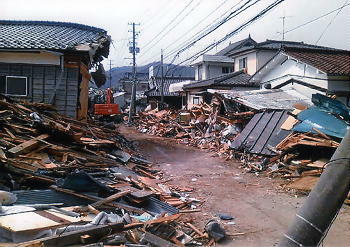 My house and everything were destroyed and gone by the earthquake and the tsunami. Though some of my family members included myself were flown away by a powerful stream of the tsunami, I think it is a consolation that none of us were injured seriously or killed. Now I feel a terror of the natural disaster, and I also feel how happy it is that our family are all safe and can live together. I want to give my heartfelt gratitude for your warm kindness, and say thank you from the bottom of my heart." "I was very moved by the warm support from people who are far away in USA. Thank you very much. I also recognize this kindness was brought to me with help of volunteer people around me in Iwaki city, Fukushima, and now my heart is full of thankful feeling for all of you. I will spend the precious money donated from you to buy lost glasses and clothes." 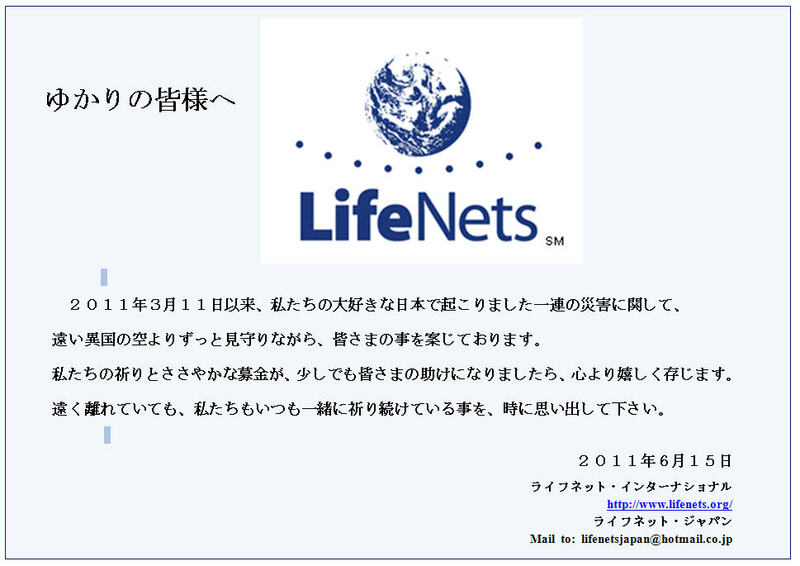 LifeNets is very happy to know that the money it has collected is being directly given to victims of the earthquake and tsunami. We appreciate Dr. Yumi Yamamoto working close to the affected areas and helping disburse the more than $11,100 collected and sent to Japan. Below is the first story about how the money has been used. Iwaki City in Fukushima Prefecture used to be a very beautiful and wonderful area in northern Japan. It has a rocky long beach with abundant fish and deep green mountains where birds never stop singing. It used to be one of the most popular and attractive sightseeing places in Japan, until March 11, 2011. On that day a series of big earthquakes seriously damaged the area, and because the city is located along the beach, many houses and people were also attacked by the tsunami. The city is south of the Fukushima Nuclear Plant, and some parts of the city are within 30 kilometers from the plant (30 km is about 20 miles and it is the area where Japanese government forbids people to enter due to the risk of nuclear contamination. It forced those whose houses survived the earthquake and tsunami to leave their towns. Twenty percent of the people lost everything. Only half the city can live normally. In Iwaki City, there is a volunteer group of which name is Yukari (it means a 'bond' of people). My friends, Dr. Kimura (ophthalmologist) and Ms. Sato (nurse at Dr. Kimura's clinic) are also members of the group which is a NPO (non political organization). Yukari had been established about two years before after a symposium for supporting visually handicapped people and now it consists of 21 volunteer members. 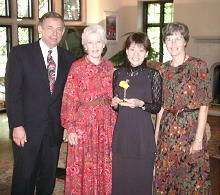 Their activities had been mainly to support visually handicapped people to live more happily and independently. An example of their activities was arranging regular picnics for sightseeing with volunteer 'visual' guides that included high school students. They also held making-up lectures for visually handicapped women with the support of Shiseido cosmetic company. 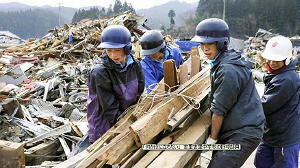 After the disaster, their activities extended further. 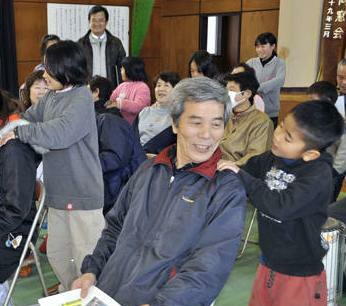 They visited people who were victims of the earthquake or tsunami. They checked for survivors and supported them generally. They knew two visually handicapped people who had lost everything in the disaster. Both of them have been suffering from glaucoma for a long time. 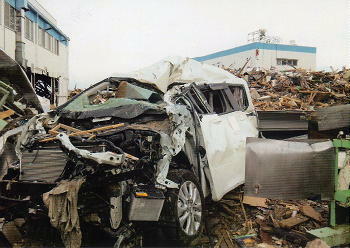 Mr. Abe was attacked by the tsunami after the earthquake. He and his wife had been struggling to survive in the muddy stream until they were finally rescued. He lost his house and everything. His daughter's family lost everything, too. Now he is living in his son's house in the same city. 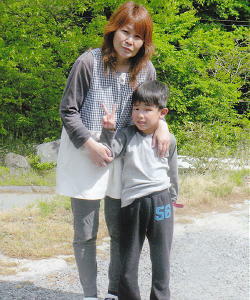 LifeNets gave 100,000 yen (about $1,250) for each of these two people on Wednesday, June 15th. Yukari people organized everything and arranged a ceremony to invite these people with their family. At the ceremony they received the donation and messages from LifeNets, in which written: "Since March 11, even though we are living far away, we have been watching and worrying about what happens with you there in our friend country, Japan. We will be very happy if our prayer and small donation could be some of your help. Though we are far away, please sometimes remember we are always with you and pray for you." A few minutes ago I talked with one of my friends whose husband and father work for a big transporting company in Japan. I asked her if we could get any cheaper way to transport aids to the area. She said she would ask to her husband tonight when he is back from work. Sending carton boxes with summer clothes is not very expensive, but the other day Ms Sato asked me if I could send electric fans. At the area people are afraid to turn on air conditioners on (it is VERY humid and hot there), because of low electricity and fear to get outside air (nuclear) into houses. Especially families who have small children are very nervous, and they want simple electric fans. But they are sold out at the electric shops in their city. In my area, I can buy cheap electric fans (about 2000 yen =25 USD). The problem was the charge to send. I thought it was ridiculous to spend 2000 yen to send a 2000 yen fan. I hope we may get a good service like with a small size of container which can carry everything we want to send. Evacuees at the shelters from the areas which are closer to Fukushima nuclear plants are allowed to have a temporary return to their houses by each group now. All of them are happy that they can go home even for a very very short time which is restricted to 2 hours. Before their departure on a bus tour from the shelter to the town, they have plans and lists of what they want to bring back, such as pictures of the lost family, bank account books, car licenses, health insurances, and any of their precious memories of peaceful good old days. But what they can bring back to the shelter is limited as much as what can be packed in a plastic bag of which size is smaller than 30x30 inches. They do not know when their next return will be (maybe a month or later). They have to wear white plastic suits to protect them from nuclear contamination. It is very hard for old people to move in these suits. At the area, it is already hot and the temperature is higher than 25 Centigrade and old people can suffer dehydration or get sick easily. They also have to be very careful not to make a tear on the suits because it is very fragile. But many of them are still happy to see their houses that are left with the image of their normal life that was ceased abruptly on March 11th. There is not anyone who insists to stay longer. Nor is there anyone who tries to get more things back than restricted. People at the towns which had the tsunami started to make their temporary return a few days ago. As same as other area people, they wish they could see their houses and bring something back. But what they saw were heaps of debris or empty flat ground which had been cleaned up already. Because they had the tsunami, they knew it but they still went to the area where their houses should have been, and came back to the shelter without anything. Donate Now! LifeNets will use 100% of your to help earthquake victims. You can also donate to LifeNets via PayPal. At the shelters there are still many old people who are weak and keep sitting all day long on cold floors. They sit in despair of their future, lament for their lost family, or just feel helpless and useless. I heard one of the items needed are reading glasses. As I have once sent hundreds of reading glasses to Asian countries through LifeNets, I thought it was something that we could provide immediately. The biggest problem was how to send. Last Friday morning a message happened to be forwarded to me. It was from Paul, one of Japanese English Teacher (JET)s . JETs are employed by Japanese government from all over the world and living even in the smallest communities to teach English at schools. 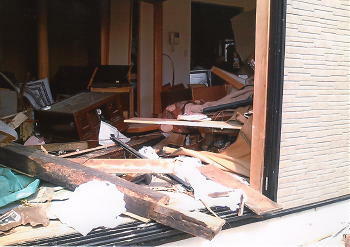 Paul lives in Akita, which is another prefecture near the disaster area, but had less damage. Paul and his friends had already been to Kisennuma in Miyagi Prefecture where more than 10,000 evacuees are still living in the buildings of an elementary school and a city hall. They have planned to visit the place again to provide fresh fruits for ten days in Japanese big national holiday, Golden Week (from April 29th to May 8th). I called Paul and asked if they could bring a few boxes of reading glasses to the shelters. He said NO PROBLEM !! The reading glasses that I had sent to Asian countries are cheap. 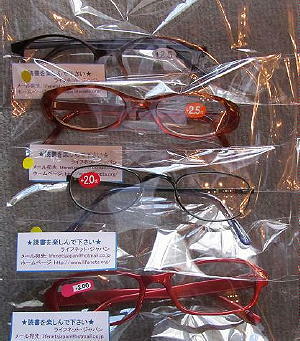 One pair is only 100 yen (about one dollar and 20 cents) and they are sold at 100 yen shops in every town. Though they are only 100 yen, the quality is not bad at all. Even my husband (cardiologist) uses some pairs which last longer than a few years. To send 500 pairs of reading glasses it costs cheaper than 60,000 yen (750 dollars) including the costs of wrapping nicely, packing carefully, and transportation to Akita, where Paul lives. I asked my friends to buy about 50 pairs for each at different 100 yen shops because in Japan we are afraid to do 'Kaishime', which means to buy selfishly as many as staff, like batteries, toilet papers, etc. and make shop shelves emply. What we have to do at the time of disaster is to consider others and share each other even at the area that is far away from it. They understood what I meant, and each went to several shops to get 50 pairs on weekend. By now I have already 250 pairs and wrapped them nicely with a sticker of LifeNets Japan. By the end of this week, I will get 500 pairs, and send them to Paul, who will bring them on April 29th! 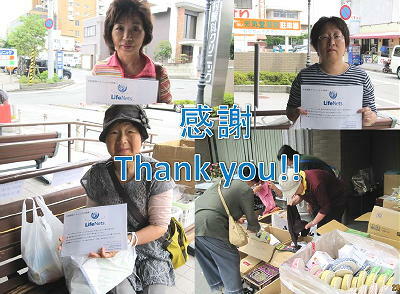 Your LifeNets donation is used, as its first aid for Japanese people in the disaster, to let 500 old people enjoy reading with the glasses, which may bring a light of joy and hope for their future lives. Thank you very much. Top: sticker attached to each pair of glasses. Right: Yumi on April 20 with the eyeglasses ready to send. Photo taken in her living room. Here in Japan the aftershocks have been happening. Last night there were shakes as big as TV had to show alerts almost every 5 to 10 minutes from 5 to 8 pm. As I wrote in the report before, houses that had survived are collapsing. Even 10 minutes ago, there was a pretty big shake on Honshu Island, of which origin was not far in the ocean. Fukushima nuclear accident has been classified as level 7, which is as high as the one in Chernobyl..
We hear a lot of heartful messages from all over the world. Thank you very much. In the midnight (11:32 pm) of yesterday, the strongest aftershock (magnitude 7.1) hit the north eastern coast of Honshu, Japan, which was the same area of the earthquake on March 11th. Fortunately the crucial damage at the atomic power plants have not been reported yet by this shake. A 79 year old man died because of a carcinogenic shock, and many others were injured. Some houses, buildings, roads, etc which had survived through the disaster were destroyed. Others which had been under reconstruction since March 11th got serious damage again. Because it happened in the midnight, this time, people who had not been at a normal mental condition already through the consequences of the disaster, were frightened extremely. Children who were sleeping at the shelters got awake because of a big shake and cried in terror. The electricity has been off at the large area. Thank you for your warm prayers and kind donations to Japan. A doctor of postmortem examination sent a message to one of Japanese newspaper companies yesterday. On the day he saw a small body with mud and grasses lying on the table at a gym that was used as a temporary shelter for dead people in Miyagi Prefecture, where more than 7,000 people were killed by the earthquake and the tsunami. Because his job is to examine the bodies of dead people, he should have got accustomed to it. But when he saw a girl who was just at the age of his own daughter, he could not hold tears. By the name tag she carried on her clothes, he could recognize she was a pupil of the third grade in the elementary school (10 years old). Her belonging was an emergency bag filled with stuff, such as retort pouches. It should have been too heavy for her to run away with when the tsunami came. He found many people died were found with heavy bags with a lot of stuff like her. Because people there knew what would come after the earthquake, they tried to run away with things as many as they could have. girl had gone immediately with no baggage, she might have survived. Ban is a two year old female dog. She was found floating on a house roof at one mile offshore of Miyagi Prefecture on April 1st, which was after 3 weeks of the disaster. 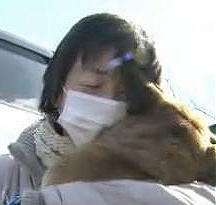 The news of her rescue was on TV, and she met her owner at last after 24 days of the earthquake. Here we had bad news and good news. People at the shelter try to go ahead with good news and it is what we have to do. Our steps for a recovery in the next many years has just begun. Here is the film of Ban. The estimated number of bodies of the people who were killed but still remained there was from hundreds to a thousand at the area within 20 kilometers (12.5 miles) around Fukushima nuclear plant. In a body that was found at 5 kilometers (3.2 miles) from the plant on March 27th, a high level of radiation was detected, and there could be many other bodies still that remained which had been contaminated by radiation after their death. 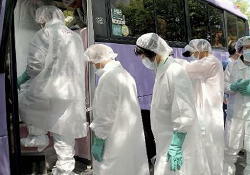 Police reported it was difficult to carry the bodies to the safe area due to the risk of a second contamination. Even at the mortuaries, it was difficult for policemen, doctors and families to identify each person or mourn their death in the risk of the contamination from the bodies. These bodies might not be buried because the soil could be contaminated. Or they might not be burned because contaminated smoke could diffuse into the air. In another page of the same newspaper, I found a picture of junior high school students. They belong to the baseball team in the same school. They were collecting wood from the destroyed buildings to make a fire in the shelters. What can we do for the future of these children? The death and the lost counted 28,000 on March 31st. Thank you for your warm prayers and kind donations to the people in Japan. 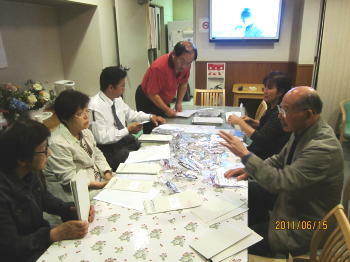 I received several reports from the doctors who are working at the area of the disasters. It is like working in field hospitals in war. They are lacking electricity, water, drugs, staffs, beds, clean gauzes, information and many other things that should exist normally. My cousin wrote me about her friend nurse. When the tsunami came which flushed out the area where she lived, she was working at hospital. Later she knew the tsunami took everything, even her parents, but she had no way to go to look for them. She had no home to go back She had no clothes to change into. She had no bed to sleep on after the hard work besides the floor at hospital. In a week or so, her parents' bodies were found. But she has to keep working like every other medical staff is doing without any funeral ceremonies for them. Twenty days have passed after March 11th. In Japan, teenagers are just same with those in other countries. At graduation ceremonies from elementary schools or high schools in March, they are sad with the departure of their school and friends, but happy and full of joy for their new life which starts soon in April. Of course, they will cry, hug, and shake hands with tears and smiles emotionally in the ceremony like as any teenagers do. Even in the area of this series of disasters, the graduation ceremonies have to be done now. Some students are missed, some teachers are missed, and someone's parents are missed, but it is what they have to do. There you may be surprised to see how calm and quiet they are. Their solemn faces are pale with running tears but they do not shout or cry. I could see when one is really in despair, they will bury and shut up all their feelings. Their sorrow is just deep, deep, and deep. But they try to keep themselves. Two weeks have passed since March 11th. I appreciate all your kind donations and warm prayers for the disasters of Japan. Here in Japan, spring is time for school new terms. Children and students have their graduation ceremonies in March and new school terms start in the beginning of April at all kindergartens, elementary schools, high schools, colleges and universities. This series of disasters happened when children were almost going to finish their last terms with full of hope for their next school terms after happy spring vacation. At one school, because all graduates were found to have survived, they had their graduation ceremony in a small classroom because their gym was occupied as a shelter with a lot of evacuees. Survived teachers and parents did their best to decorate the room as bright as their future. The president gave a speech how wonderful friendship and consideration to each other is. Of course, it is not a case for all schools. At some schools, all students including buildings and everything were lost at once by the tsunami. At other schools, they do not want to have any graduation ceremony yet, because they have classmates who were not found yet. Even though some children who survived lost their schools, at temporary shelters they have started their own schools. They got together at the corners of the shelters and started to study. There older students teach the younger ones. They lost their buildings, desks and chairs, and many teachers were busy with other things, but they have schools and learn something more important than what they can learn in the textbooks. Thank you for your prayers for Japan and our people. The earthquake occurred around 3 pm on Friday, March 11th. Children were still at school. Fortunately many of them survived the earthquake and tsunami, but they have been separated from their parents, evacuated to temporary shelters and are by themselves. It is now the fifth day after the earthquake and these children started recognizing their situation. Some older children started to look for their parents by writing the names of their parents and going to nearby shelters. One girl was standing on the hill where she could see her town below with complete destruction and shouted 'Okasan, Okasan (mother)', even though she knew she lost her house and her family, it seemed she could not accept the fact yet. These children's mental trauma is getting serious every day, which needs for proper care and support for a long while even after the recovery from their physical trauma. Since yesterday it had been snowing around the area and today evacuees had to start their day by shoveling snow. They started breakfast which was a piece of bread and hot water for each. Many are trying to send relief goods to these shelters, not only from the other parts in Japan but also all over the world. But because of the destruction of the roads and the nuclear contamination around the area, they have not arrived to people who need them yet. 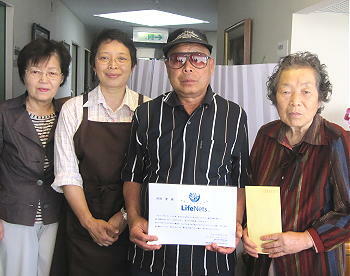 LifeNets has been approached to facilitate aid to March 11, 2011 earthquake and tsunami victims in Japan. We would like to do this. At this writing of March 16, conditions are still very chaotic in the Sendai area of northern Japan. However, it will become clear what needs to be done to help in the humanitarian suffering where thousands have died and property damage is in the multiple billions. We have at least two sources through which we can work to facilitate aid directly to victims. At this point the major relief agencies are in their initial phase of helping. Much aid will be needed as the needs of individuals become known to all us. Come back to this page for more information. You can at this time make a tax-deductible contribution in which the full amount will be applied towards earthquake victims.